7/8" Aluminum Tube in a seamless, bright anodized finish. Our 3/4" tubing fits inside to make telescopic poles. NOTE: When choosing a length of tube longer than 72" you must choose Canpar as your shipping option. This tube is stocked in 20' lengths for those customers picking up from our store. Maximum length for shipping purposes is 9'. 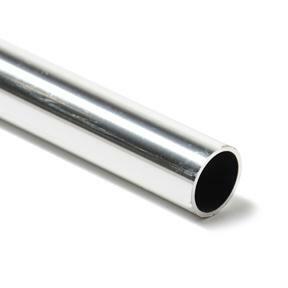 Q: What is the outside dimension of the 7/8" aluminium tubing sold on your website? I want to use it with 7/8" Inside diameter bimini fittings. The outside diameter of this tubing is 7/8". Q: what is price for 10' 7/8 aliminum tube? $19.80 but we are not able to ship it because of the length. Q: I noticed you can not ship aluminum 7/8 inch tubing. I was hoping to buy 2 pieces 8 or 9 feet long. i live in London ON. Can I drive to your outlet and pick it up? Absolutely. It is a stocked item and we are open to the public. Our hours are M - F 8:30 AM to 4:30 PM, Saturdays 10:00 Am to 2:00 PM.